Any owner of a French Mastiff, also known as a Dogue de Bordeaux will tell you that they are one of the best breeds for a family with older children to own. Their enormous size makes them ideal rough and tumble play mates for larger children, and they are incredibly loyal to those they consider to be part of their pack. Many people are put off by the sheer mass of the dog, but a closer inspection reveals a great companion dog. 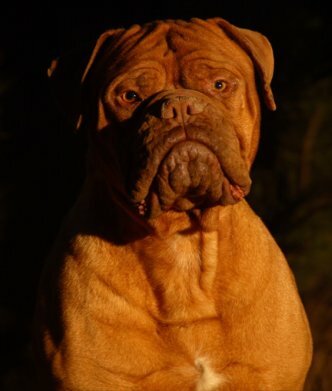 The history of the Dogue de Bordeaux is a little shady, but it’s widely believed that they are a cross between a Spanish Mastiff and a Bulldog. The breed, unsurprisingly, stems from France, and at one time there were three variations from different regions of France. The Bordeaux breed is the only to have survived. They were traditionally found in the homes of the rich landowners and were so renowned for their fierce loyalty that Adolf Hitler ordered them destroyed after the Nazi occupation of France. Only a concerted effort in the 1960s by a group of French owners has brought the breed numbers back up. The Dogue de Bordeaux falls into the giant breed category, with an adult male weighing in at around 90lbs and will easily come up to waist height. If you’re buying a pure breed, you need to look for a short yet broad skull with an abrupt stop for the nose and mouth. The ears should be small and hanging down, and ideally should be slightly rounded at the bottom. The dog’s body should be rectangular and heavy set, and the legs should support the rear at a higher level than the front. •	They are incredibly loyal. This works out well for you and your family as the dog will take you in as part of their pack and they will like to spend time in your company. However, this loyalty can backfire as they will be hostile to strangers and their size and strength can be incredibly intimidating. You can get round this by early socialization as a puppy and regular walks around with people and other dogs. •	They are a smart breed meaning that you’ll need to keep them entertained or risk having your house torn up. If you are going to leave them at home during the day, you’ll need to have a large garden for them with plenty of toys to keep them busy. •	A Dogue de Bordeaux is very large and very powerful. You’ll need to be prepared to go on a couple of long walks each day to burn off their energy. They will also eat an enormous amount of food each day, so they’re not the cheapest of dogs to own. •	They don’t all drool as much as the dog from Turner and Hooch! Egg whites were used to make the dog’s drool look worse than it actually was. Having said that, expect to find a lot of drool around the house. •	Because of their size, they are at risk of hip dysplasia as they get older, which is where the hip joint is put under stress by the dog’s own weight, causing pain and lameness. This can be counteracted by not encouraging a lot of active behavior when they’re a puppy as this is when the bones and ligaments become set for their adult life. •	You can expect a Dogue de Bordeaux to live for around 10 years or so, which is about average for its size. If you love large, loyal gentle giants, the French Mastiff may be just the dog for you.